SHEEP and beef producers are being advised to assess the extent of plant deaths in their pastures before releasing stock from feedlots and sacrifice paddocks, and especially in high rainfall areas. Consultant Cam Nicholson said with the season conditions experienced recently, there have been more plant deaths than usual in many areas. He said pasture plant deaths are more likely in higher rainfall areas that have experienced longer periods of dry weather. “And particularly in pastures that have perennial ryegrass in them – it is the perennial ryegrass plants that haven’t experienced these longer periods of dry that are the ones where we seem to be getting greater losses. 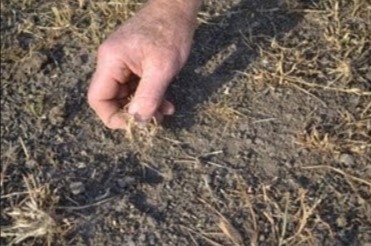 “The phalaris, cocksfoot and tall fescue plants seem to have hung on pretty well, but it is the perennial ryegrass that is probably going to be the main plant affected,” Mr Nicholson said. 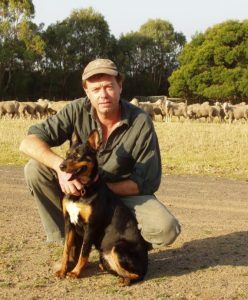 Mr Nicholson said it should be a priority to do the plant death assessments before letting stock out of sacrifice paddocks or feedlots. He said quite often plant deaths over summer often led to pastures not recovering as expected after the autumn break. Mr Nicholson said after assessing the extent of plant deaths, farmers need to reassess their management. This could mean considering whether and when to re-sow pastures or replace them with a crop and/or plant new pasture next year. “Or if say a third of the plants are pulling out, I am going to have to manage this more strategically, therefore I can’t expect to get the production out of it that I would have, so what is my fall-back position? “Or is it a case of more feeding and containing the stock longer?” he said. Mr Nicholson said if farmers do not do the assessment they could potentially lose more of the pasture due to grazing pressure on the remaining plants. He said managers could be tougher on phalaris and tall fescue pastures after the autumn break than ryegrass-dominant paddocks. Mr Nicholson is currently delivering the Feedbase Four (a series of projects in MLA’s Feedbase Adoption Plan). He said despite best management, minimal grazing and maintenance of surface dry matter, plants may have died. “Most perennials survive long dry periods by stopping growth and going into survival mode. “Their deep roots, which I call survival roots, access enough subsoil water to keep them alive,” he said. “It’s why deep-rooted species such as phalaris and our native grasses survive better than, say, perennial ryegrass, which is shallow rooted. “Heat and stress will eventually kill these species too,” he said. “Multiple stresses are deadly for plants and stress may also come from insects, low soil fertility and soil acidity as well as heat, lack of water and heavy utilisation. “Grazing just adds another stress that will make things worse,” Mr Nicholson said. Action: Business as usual and progress with feed budgeting, fertiliser planning and grazing management (see tips and tools to help below). Action: Recovery plan to build up reserves after an autumn break. Develop a grazing and feeding plan for stock to reduce reliance on stressed pastures and manage weed control to reduce competition. Reduced numbers would be considered (per m²) five to 15 plants for phalaris, tall fescue and cocksfoot and eight to 30 plants for ryegrass. Action: Resow or oversow. Determine cash flow requirements, short-term feed needs, paddock preparation and weed control. 1. Pinch clumps of dry grass, twist and pull – see if they pull out. If they’re alive, the survival roots will keep them anchored. If the plant comes away from the ground easily, there’s a good chance it hasn’t survived. 2. Just add water. Apply two good watering’s about a week apart. Twenty litres of water (a cleaned drench drum is ideal) spread over one m² (so one big step by one big step) is equivalent to 20mm rainfall. Create a small levy around the area with a shovel to hold the water in. Do this twice then observe about a week or so after the second watering for new shoots out of pasture clumps. If soil is cracked and severely drought-affected, this method might not work and in heavy clays additional water might be required. 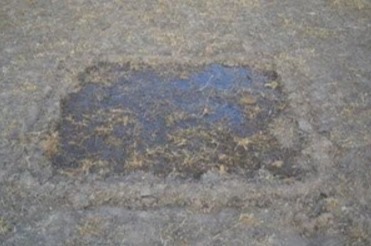 Water a metre square of pasture to assess its potential to return under good seasonal conditions.